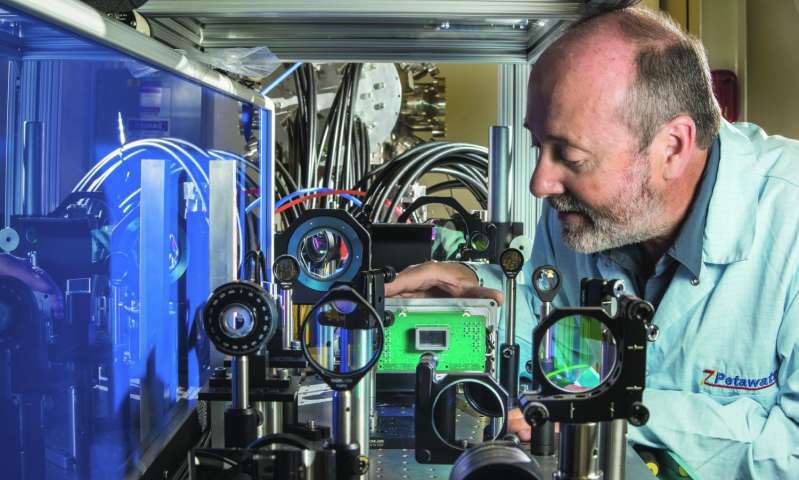 Sandia National Laboratories researchers have put together the fastest multiframe digital X-ray camera in the world, called the ultra-fast X-ray imager (UXI). The camera takes images with an exposure time of only 1.5 nanoseconds—25 times faster than the best digital cameras. "People are captivated by movies," said Sandia physicist John Porter. "We just want to make sure there are no surprises between the frames." Porter conceived and led the 10-year effort to capture plasma images more rapidly in the massive pulsed-power facility known as Z, a leading contender in the worldwide effort to achieve controlled nuclear fusion. Denser groupings of observations at shorter time intervals are essential to more accurate numerical modeling, he said: "There have been experiments where the best models predicted ignition, but it didn't happen. There are too many ways a model unmoored from sufficient data can go from start point to end point. We need to feed simulations more data to ensure more accuracy." A team of national experts have concurred, selecting further improvements to the camera as a top priority for accelerated development of next-generation diagnostics for high-energy density and inertial confinement fusion experiments. The experts, representing a coalition called the National Diagnostic Plan (NDP), includes researchers from Sandia, Los Alamos and Lawrence Livermore (LLNL) national labs, the Naval Research Laboratory, the University of Rochester, and representatives from other university and industry labs. Said Mike Holmes, manager of the Sandia team that developed the camera sensor, "For technical and financial reasons, bringing the highly accurate, relatively inexpensive UXI online was declared a leading transformational diagnostic capability for future high-energy-density physics experiments within the NDP." The camera has already been used successfully in hundreds of experiments at Sandia's Z-Beamlet Laser facility and at LLNL's National Ignition Facility. "Z camera-capability needs are different from any out there," said Greg Rochau, program manager of the Sandia effort. "There are CCD [charge-coupled device] cameras that can take a single frame faster than UXI, but none that can take multiple images at a 1.5 nanosecond temporal resolution." "This project is important," continued Rochau, "because there are dynamics happening during the stagnation phase [when the fuel is at maximum compression] that we are unable to simulate with the best computational models because we don't know what physics we're missing". "We think what's happening is at a spatial and temporal level that is smaller than we can currently observe. UXI enables diagnostics with better spatial and temporal resolution than we've ever had. Anytime you can measure something better than you could before, you learn something new." Without UXI, several expensive, radiation-hardened CCD cameras coupled to microchannel plates—each with high-voltage power supplies and a bulky, expensive support system—would be needed to record data to this precision. A single such camera might be used in successive experiments, with the camera programmed to fire a little later each time, but since no two experiments are exactly alike, it's hard to be sure how many nanoseconds into the second, third and fourth experiment the camera should capture. Then there's the expense of running the same experiment over and over. The Sandia technology is available for licensing at significantly less cost, and could be of interest to government labs, industry and universities whose research could prosper from a new ability to view a succession of chemical, nuclear or biological reactions that occur in nanoseconds. The sensor, developed in partnership with Z at Sandia's Microsystems and Engineering Sciences Applications (MESA) center, consists of a radiation-hardened integrated circuit bonded to a silicon photodiode array. The bonding of these two integrated circuits joins two wafers, like two pancakes stitched together, into a monolithic hybrid structure. "To date, we have created three generations of hybrid sensor cameras, each of which improves on its predecessor," said MESA team lead Marcos Sanchez. The current sensor arrangement used at Z and NIF is a one-half megapixel camera, with two frames of image storage per pixel. Subsequent sensors added the ability to capture more frames by turning on rows of pixels at different times and by increasing the number of storage frames per pixel. "Another unique feature of our sensors is the ability for a user to adjust both the shutter- time and the time between subsequent shutter openings," said Sanchez. Each sensor's shutter speed and inter-frame time can be set from 1.5 to 19 nanoseconds, making the sensors highly configurable to match the parameters of the experiment. Almost all sensor development was accomplished at the MESA facility. "Having a silicon integrated circuit foundry as well as a compound semiconductor fab, and co-located testing, integration and packaging facilities enables the development of unique products such as UXI," said Sanchez. Work in progress with General Atomics in San Diego promises to shorten the image time to the 20 picosecond range within a year by coupling a UXI sensor to an innovative 'pulse-dilation' tube developed by researchers at General Atomics and LLNL. A picosecond is one-thousandth of a nanosecond. The development of the UXI camera to date has been a cooperative effort within Sandia and with its partners.